It’s summertime, which means watermelon! 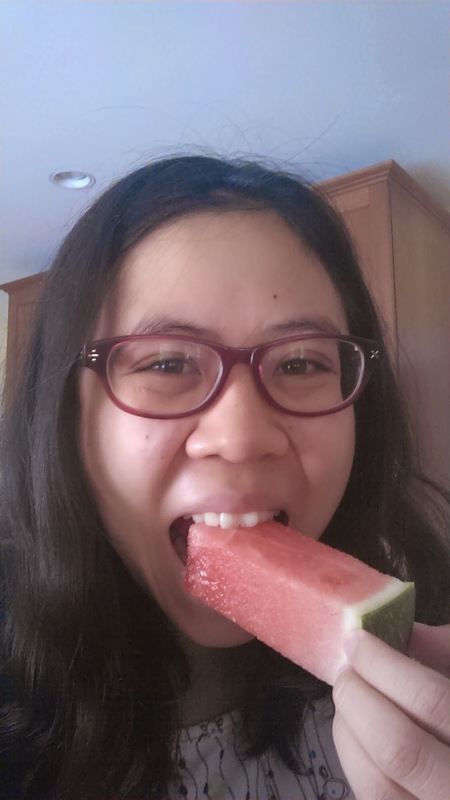 There are actually two parts to this post: first, the smarter way to cut watermelon (so you don’t end up with watermelon juice all over your face/hands/clothes), and second, a goofy little experiment I did the other day to figure out the best way to buy watermelon. 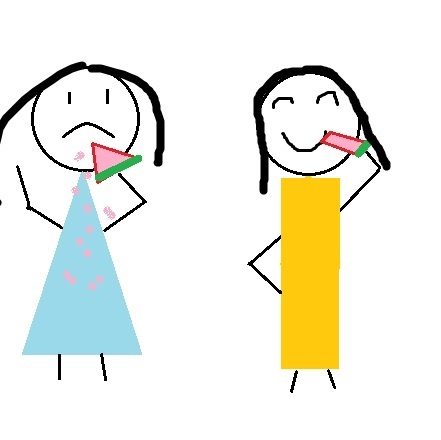 On the left I’m positively melon-choly. On the right I don’t understand w(h)at ‘er problem is. 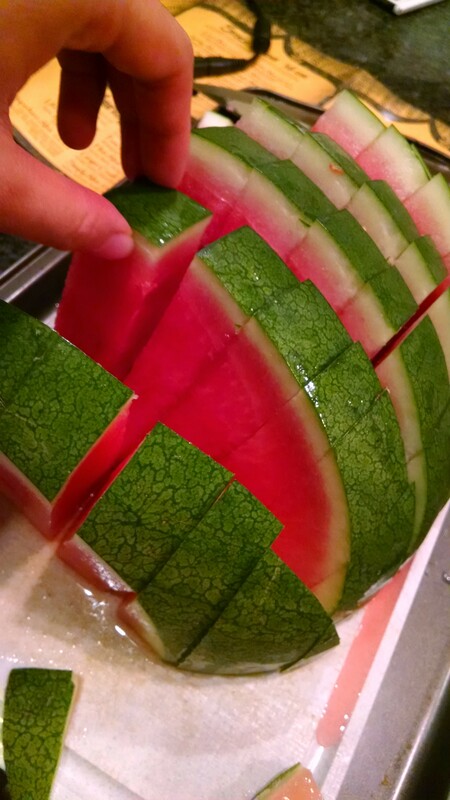 You start the same, cutting a watermelon in half and laying it flat side down for safe cutting. Instead of making on vertical slice and lots of horizontal slices (as you would for wedges), you make equal numbers of vertical and horizontal cuts. This forms a lattice- it’s best if each square is about an inch to an inch and a half long. 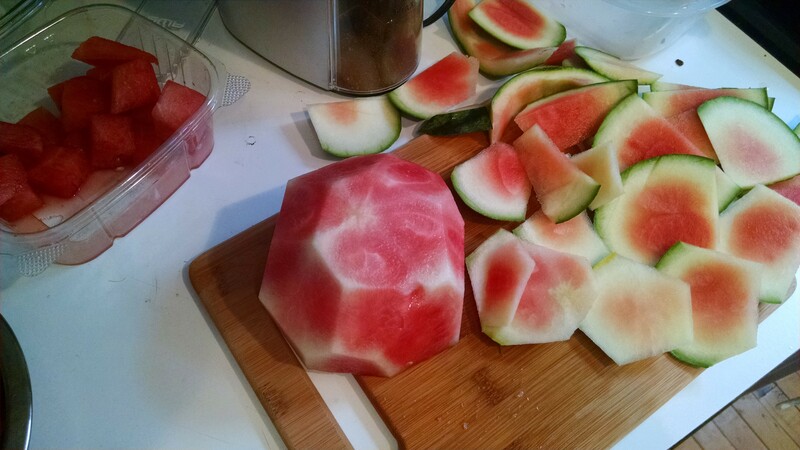 Discard the corner/end pieces that have no watermelon, and voila! Watermelon fries! Now for the second part of the post! What’s the best way to buy watermelon? That is, if you can’t carry a 15-20 pound watermelon yourself (for whatever reason). Sometimes stores carry big slices of watermelon, so I’ve bought plenty of 5 pound slices this summer, which I highly recommend. But yesterday the store only had a box of precut watermelon for $3.90 or a personal sized watermelon for $4.99. So of course I bought both, for you blog readers (or because I wanted watermelon). We wait & watch… which watermelon will win the war? I decided to go by weight, but also tried a rough volume calculation ahead of time. Clearly there’s space in the box, but I didn’t want to measure each piece and calculate volume so I just did the volume of the box. Similarly, there’s rind in the watermelon and it’s not a perfect sphere, but hey, this is why I’m a mathematician and not an experimental scientist. Again this volume calculation is pretty bad: you can see how much space is in the box above, and once we cut open the watermelon, how much rind there actually is. After measuring the box/melon, the first thing I did was weigh the precut melon using my husband’s fancy scale and a bowl. 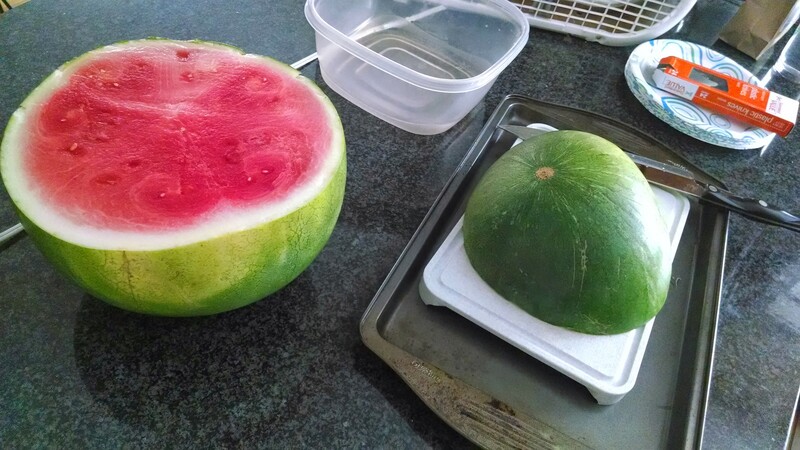 Then I ate a lot of that melon, and started cutting the mini watermelon (not the smart way). 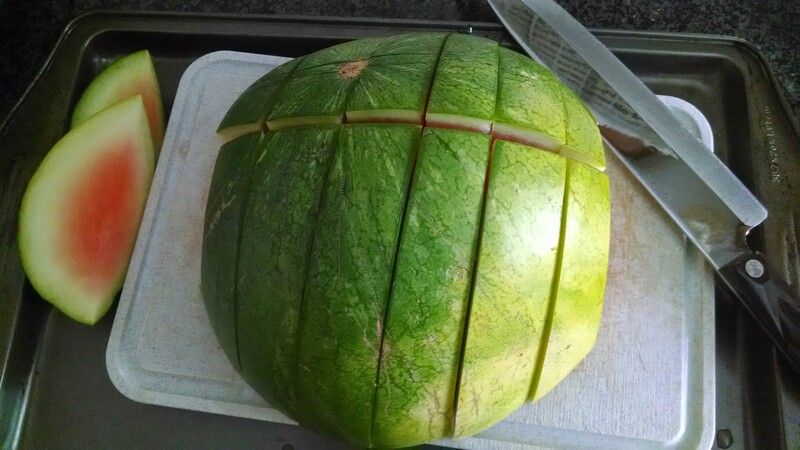 I wanted to get as much watermelon as possible out of the mini melon, but still cut off all the white parts since the precut didn’t have any white parts. 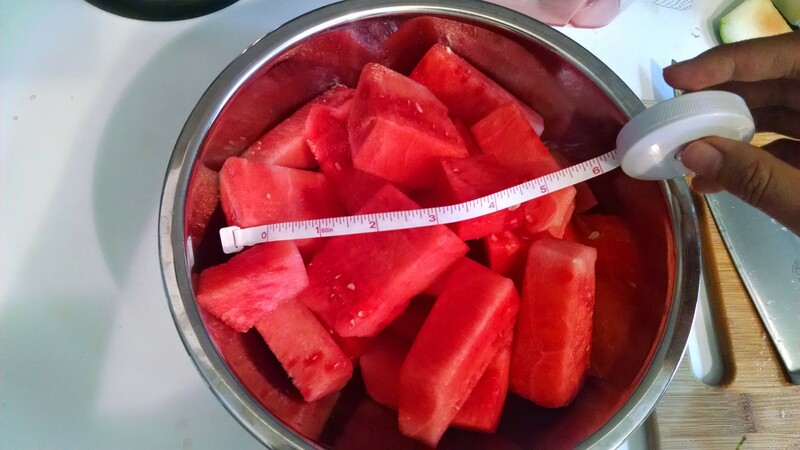 One thing that I thought was crazy was the next picture: I’ve unwound the measuring tape to 6″, the diameter of the mini melon, but you can see how much more melon there is. Then again, the bowl isn’t so deep so this isn’t that crazy. So that’s how long six inches is! 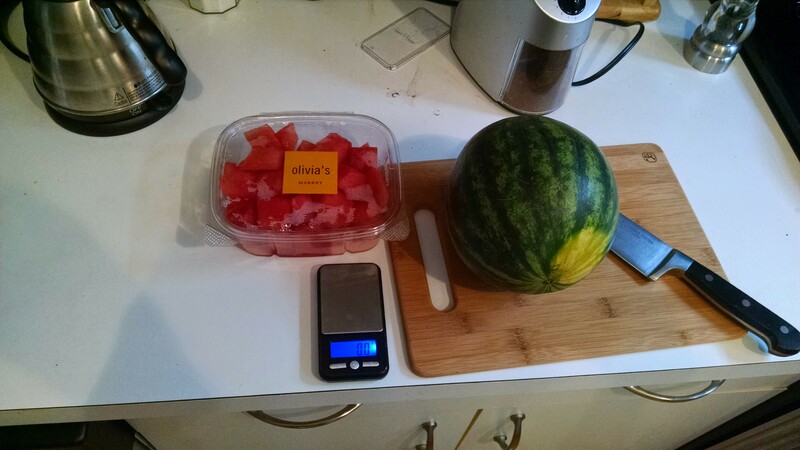 Also, I needed to do three weighings for the mini melon because the scale couldn’t hold that much. The mini melon held twice as much melon as the box did! It was really crammed in there vs. all the space in the box, I suppose. So the mini melon is clearly the better deal, right? You get almost twice as much melon per dollar spent, even though you spend an extra dollar. The precut watermelon was perfect- sweet, juicy, with just the right amount of bite. I ate almost the entire box while doing this “experiment,” which means I ate an entire pound of watermelon in half an hour. It was like every piece was from that magical inner zone of watermelon which isn’t too mushy (the exact center) but is still sweet (not touching the rind). 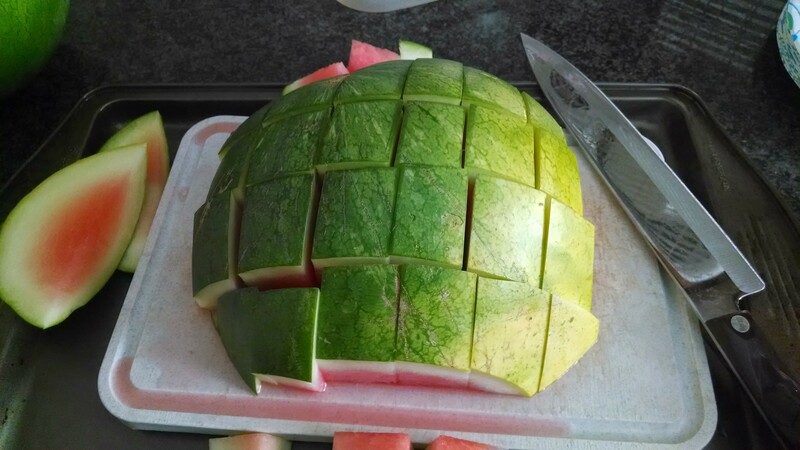 Meanwhile, just about every piece in the personal watermelon was a rind-piece. It’s just not big enough to get to that magic zone. Even the store clerk thought I’d picked out a good one! 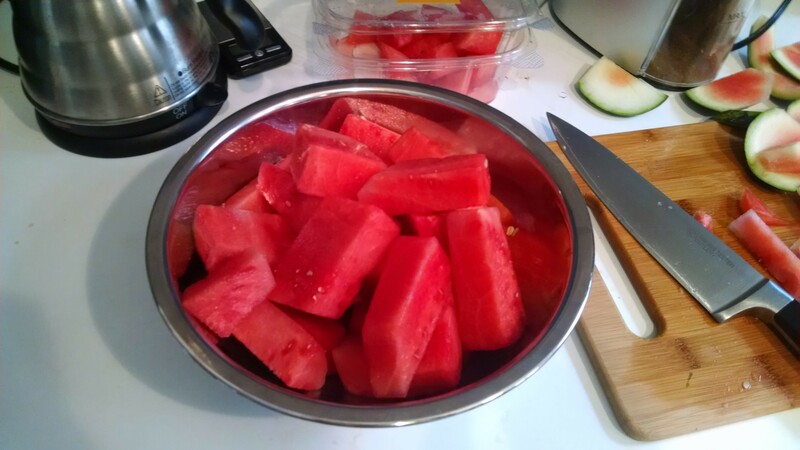 I’m going to make gazpacho with those two pounds of watermelon because I want to hide the lack of sweetness. Next time I want watermelon (like tomorrow), I’m going to pay the premium and buy the precut. I would encourage you, however, to buy a whole watermelon and cut it into fries as above. That is, if you can carry a watermelon. This is a great post! Love the drawing, love the idea, and useful results!